Too faithful, perhaps. From various sources, the production faithfully replicated the original dance numbers down to the casual racism and sexism that permeated so much American culture of the mid 20th Century. White performers played the role of Puerto Rican Jets from West Side Story, white dancers pretended to be Native Americans in a mocking manner and sailors got prospective dates drunk, presumably to have their way with them. Of particular interest to Asian Americans is that the Uncle Tom’s Cabin number from The King and I was included. 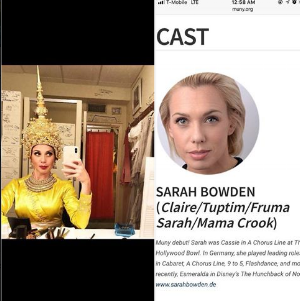 And cast as Tuptin, a Burmese concubine, was Sarah Bowden, an Australian woman who was definitely not of Asian background. There is speculation that since this actor has to play other roles (taken from On the Town and Fiddler on the Roof), the casting was appropriate. However, this excuse fails to make sense since a) there ARE Chinese Jews and b) the On theTown role was for a New Yorker (who had Asians even in the 1940s…because, the ORIGINAL romantic lead in On the Town was Japanese American). One of the local groups critical of the MUNY was the Saint Louis chapter of OCA – Asian Pacific American Advocates, who pointed out that the MUNY’s action was in stark contrast with ith those of Opera Theatre of St. Louis, which launched a year-long dialogue with the local Asian-American community in advance of its premiere of An American Soldier, an opera with libretto by David Henry Hwang, that deals with the difficulty faced by many Asian-Americans who feel stigmatized as perpetual foreigners in their own country. Getting wind of this odd-headed production, members of the Consortium of Asian American Theaters and Artists (CAATA), the national organization advocating for Asian American theatre artists decided to take action. In St. Louis for the national meeting for the Theatre Communications Group (the national organization for non profit theatres), these CAATA members, along with members from other ethnic groups, attended the Friday showing and staged a noisy protest during the yellowface scene and walked out from the theatre. According to some advocates, while it was regrettable that the performance was disrupted, it was a tactic of last resort as earlier attempts to resolve this issue within the production were brushed aside (and that an assertive, outside commentary was necessary). Andrea Assaf has put together a video on the issue. American Theatre article on the discussion (including the fact that the MUNY had previously been protested and a performance disrupted by local black activists). Emilio Ramos, a member of the ensemble for Jerome Robbins’ Broadway writes a lengthy blog article on the incident. Rachel Grossman writes a blog post of the need to address this on a systems level and not just for individual instances. (And names some EASY things for non-POCs to do). American Theatre podcast Is Whitewashing Ever OK? Facebook post from the St. Louis Rising Leaders of Color co-hort. Arts Administrators of Color Podcast, June 28, 2018, Systems Thinking. (contrasting the MUNY with St. Louis Opera). Chad Bauman, Managing Director of Milwaukee Rep, writes more generally on casting and inclusivity here.